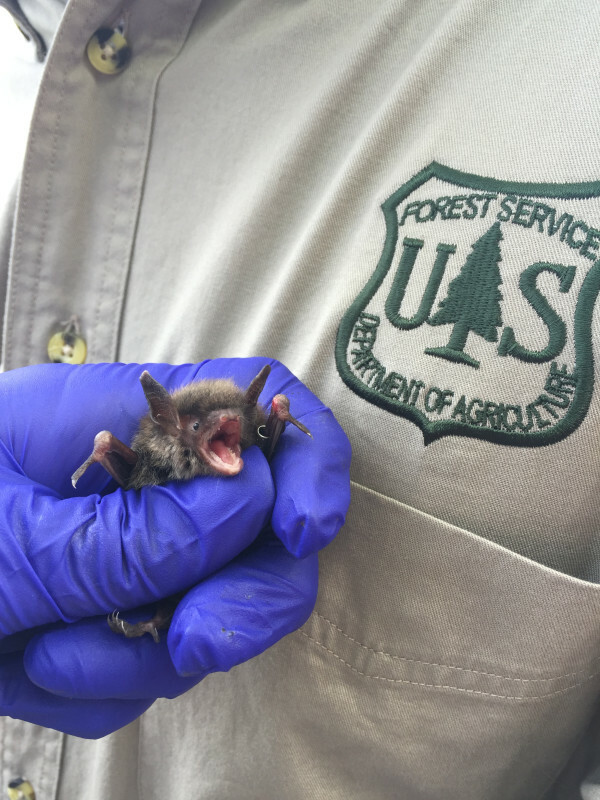 A little brown bat with no visible sign of white-nose syndrome is released into the wild on May 19 after surviving the winter in Mark Twain Cave Complex in Missouri. A little brown bat with white-nose syndrome. A group of biologists and local residents gathered outside the Mark Twain Cave Complex in Missouri on May 19 to watch the release of 150 special bats. The bats were some of the first to be successfully treated for white-nose syndrome, a fatal disease that has wiped out millions of bats in the eastern half of the United States and Canada since it first appeared about a decade ago. The treatment, based on the common bacterium Rhodococcus rhodochrous, was developed by Dr. Christopher Cornelison and several fellow researchers and students at Georgia State University. “It was great to be there and more-so to see the locals who came out,” Cornelison said. “Those people who have been going to that cave for decades, spending their lives around these animals. A couple of years ago, when the mass mortality of the bats began, they were heartbroken. 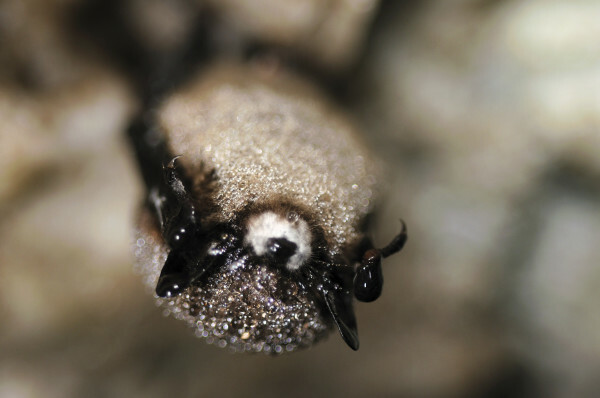 White-nose syndrome was first discovered in the U.S. in 2006 in a cave in New York. Since then, it has spread rapidly, killing more than 5.7 million bats. The disease was given its name because of the white fungus that grows on noses, wings, ears and tails of infected bats while they hibernate. The fungus — which thrives in cold, damp environments, such as bat caves — eats away the bat’s skin, disturbs its hibernation and causes it to expend energy until it starves. Most bats infected with the disease don’t live through the winter. In 2012, Cornelison and a team of researchers at Georgia State University began looking at Rhodococcus rhodochrous, a common soil bacterium, as a solution for managing white-nose syndrome. “What ends up happening is the cells produce chemical compounds that disperse through the air, and those compounds are capable of permanently inhibiting the fungus and slowing growth of mycelium [the vegetative part of a fungus],” Cornelison said. Bats hibernating in four caves — two in Kentucky and two in Missouri — were captured for the trial treatment last fall. Numbered bands were placed on the bats forearms, and they were placed in an enclosure with the induced bacterium. After 48 hours, the bats were released into mesh enclosures in their natural hibernacula and monitored all winter. When the bats rose in this spring, they were collected for inspection. Not only had they survived the winter, the bats appeared to be free of white-nose syndrome. The seemingly healthy bats were set free. Maine appeared to be insulated from white-nose syndrome until spring 2011, when biologists found white fungus growing on bats in two caves in Oxford County, according to a previous BDN story. An effort to stop the disease had long been underway. A large group of state and federal agencies, wildlife organizations, laboratories and universities were collaborating in research to better understand the white-nose syndrome, slow its spread and save the bats being infected. In 2012, a batch of infected bats were sent to Limestone, Maine, for an experiment led by the U.S. Fish and Wildlife Service. 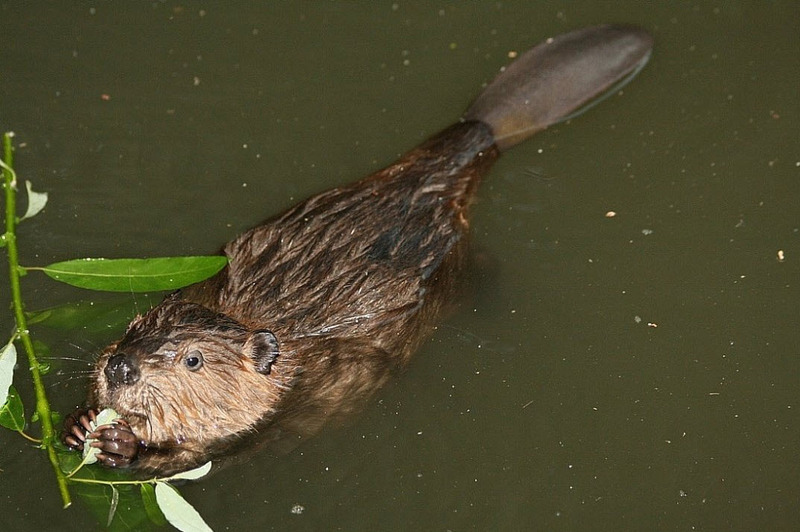 The plan was to test whether sterilized, artificial hibernacula could be effective in reducing the impact of the disease. The bats were placed in old military bunkers at the former Loring Air Force Base, now a part of the Aroostook National Wildlife Refuge. Fixtures had been secured to the bunker walls for bats to roost upon, and pools of water were installed on the floor. Throughout the winter, they were monitored by video camera. The outcome was grim. Just nine of the 30 bats survived the winter. The bats that died were covered with white fungus. By 2013, three bat species in Maine — little brown bats, northern long-eared bats and eastern small-footed bats — had seen somewhere between 80 and 100 percent declines in their populations. The success of the new bacterium-based treatment in Missouri and Kentucky has given people hope that there may be a way to control the bat-killing disease, but the battle isn’t over yet. Cornelison and his team plan to engage new states in the research and increase their number of trials for the upcoming winter. They also are focusing on how to optimize their treatment regime. And they need to know how this treatment could affect cave ecosystems. As far as Maine goes, Mosby isn’t sure whether the state’s bat caves would be candidates for the trials. To learn about white-nose syndrome, visit whitenosesyndrome.org.